2015 NFL Power Rankings - Week 5 By Robert Ferringo We have a month's worth of data in the NFL and now we're starting to see the ripples and the contours to how this season will shape itself. Statistical handicappers, like myself, need at least four games' worth of stats before we can make any reliable projections, predictions, or maneuvers. But no matter what your statistic of choice when it comes to NFL handicapping the one number that you should ignore at this point of the season is simple: wins. For years baseball stat-heads have lamented the use of a pitcher's win-loss record as a primary measurement of his ability and performance. The argument is that wins are arbitrary and that they ignore most of the other facets of the game that are well beyond a pitcher's control. Football is not exactly the same, from a numbers point of view. But the theory holds: wins have more to them than just how well a team is playing. Who your opponent is and when you play them is a massive factor in NFL betting. And other situational factors that are unquantifiable can play a key role as well. In that vein, you absolutely want to pay attention to a team's schedule through the first four weeks of the season. Teams like Carolina, Atlanta and the Jets have gotten off to robust starts. While clubs like Chicago, Kansas City and Detroit have floundered. But if you dig deeper and account for the opponents that those six teams have played I think you'd agree that the teams in the first group could very easily be suffering the fates of the latter simply by flip-flopping schedules. At the end of the day teams still need to win. The NFL is no different than NFL betting: it's a bottom line business. Guys like Chip Kelly can obfuscate all they want. But the cash I win or lose gambling each week doesn't come with a contingency if your team was supposed to win but didn't thanks to four turnovers and an extra point. However, if you're trying to make solid predictions moving forward it is important to understand the context in which statistics are created and not to simply focus on the numbers themselves. With that in mind, here is Doc's Sports NFL Power Rankings for Week 5: 1. Green Bay Packers (4-0) - The Packers were predictably languid in San Francisco last week, coming off their Monday night win during Week 3. But they still managed another win both SU and ATS, making the Packers, Bengals and Panthers the only three teams to cash a ticket every week of the season. Green Bay returns home for two more games, this week's tilt with the Rams and next week's game against the Chargers (who are coming off a short week). Pencil them in for 6-0 heading into their bye week. The favorite is 8-0 ATS the last eight times they have played the Rams, with the most recent meeting in 2012. 2. New England Patriots (3-0) - I couldn't believe that the Patriots spread opened at less than 10 points. Apparently the public thought the same thing because this spread immediately jumped from an open of 7.5 to 8.5. I will still be surprised if it doesn't go up another point by kickoff. The Patriots are coming off a bye (they are only 10-7 ATS in their last 17 after a week off) and they have had a look of menace in their face all season long. Having domestic violence-purveyor Greg Hardy making cracks about Tom Brady's wife probably didn't help either. Don't poke the bear dude. 3. Arizona Cardinals (3-1) - It is as if everything that I took time to praise the Cardinals for went in the complete opposite direction last week. They allowed four sacks last week after allowing just one in the three weeks prior. Their red zone efficiency was at 92 percent, but last week they went just 1-for-5. And turnovers, something their defense had capitalized on through the first three games, absolutely killed the Cards in their loss to the Rams. However, like several teams that lost last week, the Cardinals were clearly the better team on the field with the wrong result. 4. Cincinnati Bengals (4-0) - The Bengals are looking to go 5-0 for the first time in nearly 30 years this week. That's a lot of losing history to overcome. But they have the obvious situational advantages of getting Seattle off a short week as well as catching the well-traveled Seahawks in the Eastern Time Zone. Cincinnati was in a very similar situation last week against the Chiefs and mutilated one of the better defenses in football. They will win this week if they can do the same to the Seahawks stop unit, which is crystalizing. The Bengals are 18-5 ATS in their last 23 home games and this - between -1 and -4 - is their best price range. 5. Denver Broncos (4-0) - It is getting sadder and sadder to watch Peyton Manning. At this point I feel like his arm strength has been discussed ad nauseam. But the guy really can't throw the ball down the field at all. And that lack of firepower is going to make it extremely difficult for the Broncos to cover the large spreads that their improving record is going to bring upon them. The Broncos have beaten the Raiders seven straight times and are a perfect 7-0 ATS against them. However, this if the first time the spread has been less than 6.5 since…the last time the Raiders beat Denver, as three-point underdogs back in 2011. 6. Seattle Seahawks (2-2) - Well, the Seahawks were gifted yet another win on Monday Night Football. They will certainly take it. But you can't really say that they looked good in that game. Their offense is still a total wreck. And Marshawn Lynch is not the answer for it. These guys just aren't in sync. Seattle is just 18-39 ATS in its last 57 games in October and they are just 1-5 ATS in their last six games overall. 7. Minnesota Vikings (2-2) - I know this seems high for a 2-2 team with low expectations. But I just really like what I see from the Vikings. They took every shot that Denver threw at them and kept coming. Minnesota is extremely physical defensively and I like their skill position players on offense when they get healthy. 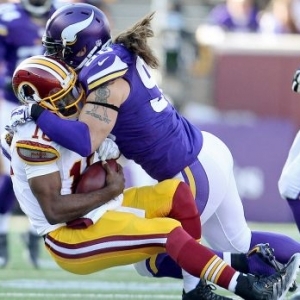 Their bye week comes at a good time, as the Vikings take two weeks to prepare for a physical, well-coached Chiefs team. 8. Atlanta Falcons (4-0) - Efficiency, efficiency, efficiency. That's what this team is all about. They're converting over 54 percent of their third downs - they were 56.3 percent in their last game - and their red zone offense has been clicking at about 80 percent lately. Kyle Shanahan is going to be very motivated to stick it to his old team this week when Washington comes to town. But Atlanta also has a date with hated rival New Orleans on Thursday. Coming off a blowout against Houston that makes this a letdown/look ahead spot for the Birds. 9. Buffalo Bills (2-2) - As I've said time and time again: this is what you get with Rex Ryan. You love the guy's shtick when your team is winning. But when they are losing because of his awful coaching (the guy really needs to just go back to being a coordinator, but he never will) then Ryan's act gets old really quickly. However, penalties aren't the only issue that this, one of the most talented teams in football, has. Their kicker is a time bomb ready to cost them another game. Tyrod Taylor isn't running (one of his main strengths) and is checking down on third downs way too much. There's a lot going on with this team and if they fall to Tennessee - which is off a bye - they are in trouble. 10. Kansas City Chiefs (1-3) - Call it stubborn or call it hubris, but I think that the Chiefs are still one of the better teams in the AFC. Their defense was carved up by the Bengals last week and Green Bay six weeks prior. But this is where relativity comes into play. Those two offenses are playing among the best in football. The big question this week is whether Kansas City's offense can make enough big plays to cover a 10-point spread. I think that's overly optimistic and I still wonder how motivated K.C. is going to be for this game. The Chiefs are 6-2 ATS in their last eight at Arrowhead and 5-2 ATS in their last seven against below .500 teams. But they are just 3-7 ATS overall. 11. Carolina Panthers (4-0) - Well, Carolina backers cash in again. The Panthers have benefitted from the easiest schedule in the league to this point. But it doesn't matter who you play - only if you cover the spread or not. But I don't trust this team further than I can throw it. The Panthers have a bye this week before their first true test: on the road at Seattle against a Seahawks team that they've had some knockdown, drag out fights with in recent seasons. 12. New York Jets (3-1) - The Jets get a well-deserved bye week after a strong first quarter of the season. A big benefit for them will be that Eric Decker gets more time to rest and heal up. He proved again in London that he is a game changer and that when Decker is healthy this offense is competent enough to support their solid, and improving, defense. I said at the start of the season: show me a difference, at their core, between the Bills and Jets. To this point the difference has been execution…and exactly one win. 13. San Diego Chargers (2-2) - The Chargers have gone 5-1 ATS in their last six Monday Night Football games. But they are facing a Steelers team that has had a few extra days to prepare. The Chargers have been a tough team to figure out. They have a positive record and some top-end talent. But they are just 3-12 ATS in their last 15 games. The Chargers 1-6 ATS in their last seven home games and 1-10 ATS in their last 11 games against AFC teams. They do get Antonio Gates back this week, but they will likely be without Malcolm Floyd. 14. Pittsburgh Steelers (2-2) - As a handicapper I admit that Pittsburgh easily should've won and covered their game against the Ravens. They were the better team and those missed field goals in the fourth quarter were flukes. That said, I still can't believe they put the ball in Mike Vick's hands for those two fourth down plays. How is this guy still in the league, much less being expected to execute crucial situations? The Steelers have been a good bounce back team and they are 6-1 ATS in their last seven games after a loss. But they are just 1-4 ATS in their last five games on Monday Night Football. 15. Indianapolis Colts (2-2) - Both Indianapolis quarterbacks are questionable for Thursday night's game and this Colts team looks like it is on the ropes early. Much like Seattle, the Colts are lucky to be 2-2 instead of 1-3. And this could be an absolutely brutal game to watch in Houston on Thursday night. (Even worse than the loser-fest that was the Steelers-Ravens last week, in a game that seemingly no one wanted to win.) The Colts are 0-5 ATS in their last five games overall but they are 5-0 ATS in their last five games against the Texans. Indianapolis has gone 17-5 ATS in their last 22 divisional games but they are 2-5 ATS on the road. 16. New York Giants (2-2) - I have to give the Giants for playing well against the Bills. Buffalo had two touchdowns called back, missed a chip shot field goal, and were stopped on the goal line. But the fact is the Giants made plays when they had to and did a better job of overcoming their own sloppy play to get a crucial road win. The Giants were outstanding on third down defense against Buffalo, and right now New York has the No. 1 rushing defense in the league. A crucial part of their defensive execution has been to limit big plays. They have only allowed one rush over 19 yards this season. We will see how this team transitions to being a healthy underdog to a massive favorite, as they are this week. This favored role has not been kind to them in the past. 17. Tennessee Titans (1-2) - Am I massively overrating a team that will likely be 1-3 after Sunday's games? Yes, I probably am. But the more I look at the teams I have ranked below Tennessee the more I think that the Titans could deserve this ranking simply by being mediocre. I'm interested to see what wrinkles Tennessee put in on offense for this week's game against the Bills. Outside of one half at Cleveland the Titans attack has been much better than people expected. Tennessee is just 7-18 ATS at home and 6-19 ATS in their last 25 games overall. The Titans are 4-16 ATS in their last 20 conference games and this spread is holding firm despite a majority of action on the Bills this week. 18. Oakland Raiders (2-2) - There is really no way in hell that the Raiders should've been favored on the road last week. That was a terrible spot for them. But despite their situational disadvantages the Raiders still almost walked out of Chicago with a win. Now we will see if Oakland can get the monkey off its back that is Denver. Last year the Raiders lost to the Broncos by 24 points in both meetings and the home team in this matchup is a feeble 3-10 ATS. The Black Hole should be raging. But I don't know that the Raiders have shown me enough to think they can knock off the division favorite, and Oakland is just 3-7 ATS in its last 10 divisional games. 19. Detroit Lions (0-4) - This is another situation where I don't want to overreact to a team's record. They really should've left Seattle with an outright win as a double-digit underdog. That spread right there told me that this Lions team is being massively underrated. In fitting form, the Lions are taking the least public action (just 13 percent of the bets in the game) this week as they host Arizona. However, there has been a reverse line movement in that game as the spread actually dropped from an open of 3.0 to just 2.5. That's a significant RLM off a key number. 20. Baltimore Ravens (1-3) - I know they are all giggly and happy about pulling a game out of their asses against Pittsburgh. But this Ravens team is a mess. Now that Steve Smith is out (technically he is doubtful) the Baltimore passing attack is really shooting blanks. I mean, they have no one to throw the ball to. The Ravens running game has been unreliable this year and their defense has major holes in it. All in all they are a mess. Baltimore is 1-4 ATS the last five times they hosted the Browns and the home team is just 2-9 ATS in the last 11 meetings. 21. Dallas Cowboys (2-2) - It's not really fair to put the Cowboys here because they're playing without their two best players. But facts are facts. And the fact is that this is a putrid, poorly coached team without a quarterback, a reliable No. 1 receiver, any running game to speak of, or cohesion in the secondary. The Cowboys are 1-6 ATS in their last seven home games and I don't see them being able to pound the ball offensively against a Patriots defense whose strength is obviously the front seven. 22. Philadelphia Eagles (1-3) - On one hand, Chip Kelly is right: the Eagles are just a couple missed field goals away from being 3-1. But that doesn't change the tape. And both the way this team looks and the numbers on paper suggest that they are a bottom-tier team on the verge of spiraling out of control. I still have a little hope for these guys. It is likely false hope. But this week is The Alamo. If they lose to a weak Saints team their season is over. They know that. And this is only the second home game they have played so I expect The Linc to be at a fever pitch early on Sunday. 23. Chicago Bears (1-3) - I said it before last week's game against the Raiders: Chicago is really not as bad as people think they are. They've dealt with serious injuries - like, you know, losing their starting quarterback - and they've played a brutal schedule. It doesn't get any easier this week with a trip to Arrowhead in store. But John Fox has had a lot of success against the Chiefs the last three years and he knows how to scheme for what Kansas City does. The Bears are just 13-27 ATS in their last 40 games overall and 1-4 ATS in their last five road games. However, we may be reaching the point where all the value resides in starting to bet with them rather than against them. 24. St. Louis Rams (2-2) - I'm still not buying the Rams, at all. Both of their wins were impressive ones against two Top 10 teams. I grant St. Louis that. But they were divisional games, where St. Louis has been very feisty the last few seasons, and both times the Rams were beneficiaries of an absurd amount of opponents' miscues. The last time Janoris Jenkins faced Aaron Rodgers was his rookie season and he was torched for three touchdowns. We'll see if Jenkins has learned any lessons when they square off again this week. 25. Cleveland Browns (1-3) - I know that this team is not any good. But to this point I still can't wrap my head around just how bad they are. Are they 6-10 bad? Or is this going to be another vintage 4-12 Browns debacle? Josh McCown was really good again versus the Chargers last week. I'm still a little surprised that Browns brass didn't decide to go "Full Tebow" with Johnny Manziel and try to ride the momentum. But there's absolutely no doubt that McCown, who has thrown for 697 yards and four touchdowns in two weeks, is the better option and it should continue to show up in Cleveland's over/under results. 26. Houston Texans (1-3) - For all the talk about Indianapolis' shaky quarterback situation the Houston quarterback carousel is nearly as big of a mess. Bill O'Brien has completely botched this whole thing for the Texans. He should've stuck with Brian Hoyer, as he at least has some experience to fall back on. It was a rash overreaction by O'Brien and his team is going to continue to pay for it watching Ryan Mallett flounder. The home team in the Colts series is 8-2 ATS in the last 10 meetings and the favorite is 4-0 ATS when these two play. 27. New Orleans Saints (1-3) - One win can't mask the stench around this team. Especially when that win came A) in a primetime home game, B) against a team depleted by injuries, and C) in overtime of a game they tried to blow. So no, I don't think the Saints have turned anything around. The Saints are 4-10 ATS in their last 14 games following a straight up win and they have been horrible playing on grass over the past four seasons. 28. Washington Redskins (2-2) - The fact that the Redskins are tied for first place with the Giants in the NFC East says more about the state of the NFC East than it does about the Redskins or Giants. Washington is catching Atlanta at the right time - off a big win and before a division rival on Thursday. The public isn't much of a believer in the 'Skins this week though and they are catching just 27 percent of the betting action in this game. That's the third-fewest wagers of the weekend. 29. San Francisco 49ers (1-3) - I thought that the 49ers would have at least a mediocre start to the season given all the veteran talent that does still remain on the team. But San Francisco hasn't put up much of a fight the last three weeks - they have been outscored 107-28 the past three games. Things are going to get a lot uglier in the second half of the year as San Fran's schedule is relentless. Including the preseason they are 2-8 ATS in their last 10 games and San Francisco's pathetic offense remains a cash cow for 'under' bettors (8-3 in their last 11 and 19-7 in their last 26 conference games). 30. Miami Dolphins (1-3) - New head coach Dan Campbell has already broken out the Oklahoma drill at practice during Miami's bye week. I think it is about toughness. Or something. This all just reeks of a situation where a guy is way, way over his head and I think it will help to make this a glorious failure and I plan on reaping as many of the rewards as I can. 31. Tampa Bay Buccaneers (1-3) - Jameis Winston is a complete and total loser. He is going to be an absolute bust in the NFL. I know that this may seem like a bit of an overreaction to his slow start. But I wrote about what a weak prospect Winston was when he was at Florida State and I flat-out said I thought he was going to be terrible when I did my 2015 NFL Draft Grades. Generally speaking, whenever there have been two quarterbacks taken No. 1 and No. 2 one of them ends up being a franchise quarterback (Manning, Luck, Bledsoe, McNabb) while the other is a loser (Leaf, Griffin, Mirer, Couch). 32. Jacksonville Jaguars (1-3) - The Jaguars are getting closer. I will grant them that. They absolutely should've beaten the Colts - even though Indy was still reeling from the lack of Luck - and when you look back they really played the 4-0 Panthers even for over three quarters. The Jaguars may be getting Julius Thomas back from injury within the next two weeks and that should help their red zone execution immensely. I'm not ready to predict that the Jaguars will become an 'over' team overnight. But their offense has shown signs of being ready to break out. Regardless of their comical point production to this point, if you watch the way this team is playing you see that a lot of drives are being undercut by really foolish plays or near-misses in the passing game. Throughout the season I will have my NFL Power Rankings every Wednesday. My next ones will be released on Wednesday, Oct. 14. Robert Ferringo has been devastating the books so far this football season, banking six of eight winning weeks and back-to-back winning months to start the season. Robert has posted nearly $4,000 for his football clients in NFL Weeks 2 and 3 and continues to be the top long-term earner in the nation. He was good for nearly $13,000 in profit in 2013 and 2014 and has averaged $5,600 in profit for his clients the last four years. Robert's two winning months to start this season make it 14 of 18 winning football months and an unreal 37 of 53 over the last eight years! Also, Robert's proprietary KING College Football Betting System has posted two of three winning seasons and is 104-73 over the last three years (58.8 percent). We are offering new clients $60 in free college football picks for Robert's picks or any Advisory Board handicapper of your choosing. Get your free college football picks now!